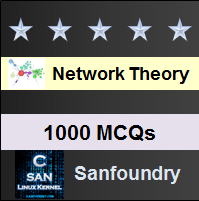 This set of Network Theory Multiple Choice Questions & Answers (MCQs) focuses on “DC Response of an R-L-C Circuit”. 1. For an R-L-C circuit, we get [D – (K1 + K2)][D – (K1 – K2)] i = 0. If K2 is positive, then the curve will be? Explanation: For an R-L-C circuit, we get [D – (K1 + K2)][D – (K1 – K2)] i = 0. If K2 is positive, then the curve will be over damped response. 2. If the roots of an equation are real and unequal, then the response will be? Explanation: If the roots of an equation are real and unequal, then the response will be over damped response. Over damped response of a system is defined as the system returns (exponentially decays) to equilibrium without oscillating. 3. If the roots of an equation are complex conjugate, then the response will be? Explanation: If the roots of an equation are complex conjugate, then the response will be under damped response. Damping is an influence within or upon an oscillatory system that has the effect of reducing, restricting or preventing its oscillations. 4. If the roots of an equation are real and equal, then the response will be? Explanation: If the roots of an equation are real and equal, then the response will be critically damped response. For a critically damped system, the system returns to equilibrium as quickly as possible without oscillating. 5. The circuit shown in the figure consists of resistance, capacitance and inductance in series with a 100V source when the switch is closed at t = 0. Find the equation obtained from the circuit in terms of current. Explanation: At t = 0, switch S is closed when the 100V source is applied to the circuit and results in the following differential equation. 6. Replacing the differentiation with D1, D2 in the equation obtained from the question 5. Find the values of D1, D2. Explanation: Let the roots of the characteristic equation are denoted by D1, D2. So on differentiating the equation obtained in the question 5, we get D1 = -200+j979.8, D2 = -200-j979.8. 7. The expression of current from the circuit shown in the question 5. Explanation: The expression of current from the circuit will be i = eK1t[c1cosK1t + c2sinK2t]. So, i=e-200t [c1 cos979.8t+c2 979.8t]A. 8. 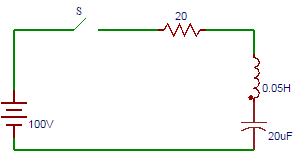 At time t = 0, the value of current in the circuit shown in the question 5. Explanation: At t = 0 that is initially the current flowing through the circuit is zero that is i = 0. So, i = 0. 9. The voltage across the inductor at t = 0 in the circuit shown in the question 5. Explanation: At t = 0, that is initially the voltage across the inductor is 100V. => V = 100V. So we can write Ldi/dt = 100. 10. The current equation obtained from the circuit shown in the question 5. Explanation: On solving the values of c1, c2 are obtained as c1 = 0, c2 = 2.04. So, the current equation is i=e-200t (2.04 sin979.8t)A.